Over breakfast at the league meetings, John Harbaugh stumped for a rule change that would allow coaches to challenge plays that millions of fans are immediately second-guessing at home. What’s the downside to reviewing player safety calls and getting them right? 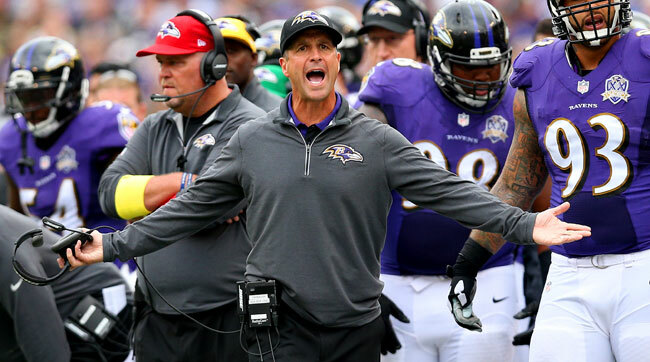 BOCA RATON, Fla. — John Harbaugh was a man on a mission Tuesday morning at the annual NFL meetings. He was out to sell the Ravens’ expanded-replay plan that faces a tough road for passage, and, as usual, Harbaugh was strong on opinions. In fact, this column could basically be written with his words alone. The Baltimore proposal, to be discussed by team officials at the Boca Raton Resort & Club, calls for the league to expand replay challenges for coaches from two to three per game, with “safety plays”—those involving helmet-to-helmet hits, unnecessary roughness, or violations of the defenseless-receiver rule—to be reviewable. As for the extra time required to adjudicate what the public would think would be a landslide of replay challenges? “That’s a red herring,” Harbaugh said at the AFC coaches breakfast. The challenges, he said, could be easily swallowed up as part of the 18 in-game commercial breaks per game. Baltimore Ravens coach John Harbaugh. That’s my pet peeve with how rules get tweaked in the NFL. It takes two or three or four years to fix things that seem so obvious. Look at the PAT rule, moving the line of scrimmage from for extra points from the 2- to the 15-yard line. That took a few years from the time it was first seriously considered to passage; last year it passed for one year only. And back on the ballot this year, it will sail through as a permanent rule. Why? Because it was a commonsense rule change that made a wasteful, automatic play a more competitive play. Common sense applies here too. Who would argue that bang-bang hits across the middle, when it’s so hard to distinguish between an illegal helmet-to-helmet hit or a legal helmet-to-shoulder-pads hat, isn’t worth taking a second look? With the increasing emphasis on rules to make the game safer, this is a slam dunk. The same people who beg for more protection for players on such hits should speak up now in support of the Ravens’ proposal—because, as Harbaugh says, it’s a matter of time before it’s included in reviewable calls. Maybe a tweak would be to not expand challenges to three. But the overriding intent of the Baltimore proposal is a smart one. Smart idea. I fear that it’s not two or three years down the road, and that’s just wrong. The three veteran AFC North coaches all weighed in on what the spate of new rules and emphasis on safety has done to the game. I asked Harbaugh, Mike Tomlin of Pittsburgh and Marvin Lewis of Cincinnati—each has been with his team for at least nine seasons—if it’s becoming somehow more problematic to coach the game.